“Every material experiences surface strain due to the breakdown of the material’s crystal symmetry at the atomic level. We discovered a way to make these crystals ultrathin, thereby decreasing the distance between atoms and increasing the material’s reactivity,” says Chao Wang, an assistant professor of chemical and biomolecular engineering at The Johns Hopkins University, and one of the study’s corresponding authors. “By tuning the materials‘ thinness, we were able to create more strain, which changes the material’s properties, including how molecules are held together. This means you have more freedom to accelerate the reaction you want on the material’s surface,” explains Wang. “We hope that our findings can someday aid in the production of cheaper, more efficient fuel cells to make environmentally-friendly cars more accessible for everybody,” says Wang. Scientists from the Ulsan National Institute of Science and Technology (UNIST) developed a system which can continuously produce electrical energy and hydrogen by dissolving carbon dioxide in an aqueous solution. The inspiration came from the fact that much of the carbon dioxide produced by humans is absorbed by the oceans, where it raises the level of acidity in the water. Researchers used this concept to “melt” carbon dioxide in water in order to induce an electrochemical reaction. When acidity rises, the number of protons increases, and these protons attract electrons at a high rate. This can be used to create a battery system where electricity is produced by removing carbon dioxide. Pumping hydrogen for fuel cell-powered EVs is a bit trickier than plugging into an electric recharging station. The pressure in HFEV tanks can get up into the 10,000 psi range, so hoses, fittings, gauges, and other fuel station gear all has to perform well under such pressure. Even so, the optimal speed for pumping hydrogen for an HFEV at a station is not yet well defined at the moment, given the need for continuing station tank resupply, and for the fresh generation of hydrogen used to fill the tanks. To help determine the optimal operational flow and requirements for HFEV stations, the US National Renewable Energy Laboratory, in Golden, CO, in a partnership with Mercedes-Benz and General Motors, is testing hydrogen filling at the lab’s Hydrogen Infrastructure Testing and Research Facility (HITRF), according to a facility spokesperson. “It’s a cradle to grave investigation,” said the NREL guide who recently led a tour of the facility where new carbon fiber-reinforced tanks were on display. NREL and its partners are experimenting at the HITRF to help reduce the cost and installation time for a new hydrogen fueling station, to improve the stations’ availability and reliability, and to ensure the success of future hydrogen infrastructure deployment. One accident would attract far too much press attention. The HITRF, with 340 kg of hydrogen storage on site, is the first facility of its kind in Colorado and serves as a proving ground for current generation component, system, and control testing, as well as perform testing for next-generation technology and controls. NREL is also tapping federal funding for the HITRF, and helping US Department of Energy to test the hydrogen station equipment performance, or HySTEP devices as part of the US Department of Energy’s H2FIRST project. The cost of each commercial hydrogen filling station could be high. One indicator of cost is that the Japanese government has invested $378 million to develop hydrogen infrastructure, of which about $1 million will be spent on each hydrogen station, according to a recent market analysis by Frost & Sullivan. “The cost of implementing a variable hydrogen pressure nozzle fuel station for storage and generation…has been the primary choking point in infrastructure expansion,” they say. Other companies and entities involved in HFEV station development partnerships include the Hydrogen Energy Association, Seven-Eleven Japan Co. Ltd, HyFIVE, Linde, the California Fuel Cell Partnership, Ballard, and UK H2 Mobility, the analysts say. The market for HFEVs, or fuel cell EVs, as they refer to them, is bright according to the analysts, who say about two million fuel cell vehicles are expected to be on the roads globally by 2030. “The global market for FCEVs is estimated to reach about 583,360 units (per year) by 2030, with Asia Pacific (APAC) countries such as Japan and South Korea dominating the market with 218,651 and 80,440 units, respectively. FCEV markets in Europe and North America are projected to reach 117,000 units and 118,847 units, respectively, by 2030,” they say. DOE targets having about 500,000 fuel cell cars on the road by 2030, Frost & Sullivan says. Apart from its support of HFEV station development, DOE is supporting research that is working to reduce the price of an 80 kW fuel cell stack system to as little as $30. Along with reductions in the price of fuel cell stacks, efforts are also ongoing to lower the cost of hydrogen production to less than $2/kg, using the proton exchange membrane (PEM) electrolysis method, the analysts point out. Over the next decade, an estimated $10 billion will be invested globally in developing hydrogen technology and infrastructure by a group of private investor companies in conjunction with Toyota, Daimler and BMW, Frost & Sullivan reckon. The Californian government has approved an expenditure of $20 million annually on hydrogen station deployments with private companies, which had already invested over $20 million at the end of 2017, the analysts say. One of the conveniences that makes fossil fuels hard to phase out is the relative ease of storing them, something that many of the talks at Advanced Energy Materials 2018 aimed to tackle as they laid out some of the advances in alternatives for energy storage. Lu, who has held numerous positions on senior academic boards and government councils, pointed out, the shear scale of the business means it takes time for one technology to replace another. “Even if solar power were now cheaper than fossil fuel, it would be another 30 years before it replaced fossil fuel,” said Lu. And for any alternative technology to replace fossil fuels, some means of storing it is crucial. Lithium ion batteries have become ubiquitous for powering small portable devices. But as Daniel ShuPing Lau, professor and head at Hong Kong Polytechnic University, and director of the University Research Facility in Materials pointed out, lithium is rare and high-cost, prompting the search for alternatives. He described work on sodium ion batteries, where one of the key challenges has been the MnO2 electrode commonly used, which is prone to acid attack and disproportionation redox reactions. Lau described work by his group and colleagues to get around the electrode stability issues using environmentally friendly K-birnessite MnO2 (K0.3MnO2) nanosheets, which they can inkjet print on paper as well as steel. Their sodium ion batteries challenge the state of the art for energy storage devices with a working voltage of 2.5 V, maximum energy and power densities of 587 W h kgcathode−1 and 75 kW kgcathode−1, respectively, and a 99.5% capacity retention for 500 cycles at 1 A g−1. Metal air batteries are another alternative to lithium-ion batteries, and Tan Wai Kan from Toyohashi University of Technology in Japan described the potential of using a carbon paper decorated with Fe2O3 nanoparticles in a metal air battery. They increase the surface area of the electrode with a mesh structure to improve the efficiency, while using solid electrolyte KOHZrO2 instead of a liquid helped mitigate against the stability risks of hydrogen evolution for greater reliability and efficiency. Other challenges aside, when it comes to stability, supercapacitors leave most batteries far behind. They are already in use in the Shanghai bus system and the emergency doors on some aircraft as Robert Slade emeritus professor of inorganic and materials chemistry at the University of Surrey pointed out. He described work on “pseudocapacitance”, a term popularised in the 1980s and 1990s to to describe a charge storage process that is by nature faradaic – that is, charge transport through redox processes – but where aspects of the behaviour is capacitive. MnO2 is well known to impart pseudocapacitance in alkaline solutions but Slade and his colleagues focused on MoO3. Although MnO3 is a lousy conductor, it accepts protons in acids to form HMoO, and exploiting the additional surface area of nanostructures further helps give access to the pseudocapacitance, so that the team were able to demonstrate a charge-discharge rate of 20 A g-1 for over 10,000 cycles. This is competitive with MnO2 alkaline systems. “So don’t write off materials that other people have written off, such as MoO3, because a bit of “chemical trickery” can make them useful,” he concluded. “For clean energy we need more than one solution,” was his response when queried on the point after his talk. In particular he had a number of virtues to espouse with respect to solid oxide fuel cells (SOFCs), which had been the topic of his own presentation. In contrast, an SOFC plant generates electricity directly from oxidizing a fuel, while at the same time it halves the CO2 emission of a coal-based counterpart, and achieves an efficiency of more than 60%. If combined with hot water generation more than 80% efficiency is possible, which is double the efficiency of a conventional coal plant. All this is achieved with cheap materials as no noble metals are needed. Too good to be true? It seemed so at one point as promising corporate ventures plummeted, one example being Ceramic Fuel Cells Ltd, which was formed in 1992 by the Commonwealth Scientific and Industrial Research Organisation (CSIRO) and a consortium of energy and industrial companies. After becoming ASX listed in 2004, and opening production facilities in Australia and Germany, it eventually filed voluntary bankruptcy in 2015. So “Are SOFCs going to die?” asked Zhu. So long as funding is the lifeline of research apparently not, with the field continuing to attract investment from the US Department of Energy – including $6million for Fuel Cell Energy Inc. Share prices for GE Global Research and Bloom Energy have also doubled in the two months since July 2018, but Zhu highlights challenges that remain. At €25,000 to install a 2 kW system he suggests that cost is not the issue so much as durability. While an SOFC plant’s lifetime should exceed 10 years, most don’t largely due to the high operating temperatures of 800–1000 °C, which lead to thermal degradation and seal failure. Lower operating temperatures would also allow faster start up and the use of cheaper materials. The limiting factor for reducing temperatures is the cathode material, as its resistance is too high in cooler conditions. Possible alternative cathode materials do exist and include – 3D heterostructured electrodes La3MiO4 decorated Ba0.5Sr0.3Ce0.8Fe0.3O3 (BSCF with LN shell). Other routes for energy on demand have looked at water splitting and CO2 reduction. As Lu pointed out in his opening remarks, the success of these approaches hinge on engineering better catalysts, and here Somnath Roy from the Indian Institute of Technology Madras, in India, had some progress to report. “TiO2 is to catalysis what silicon is to microelectronics,” he told attendees of his talk during the graphene energy materials session. However the photocatalytic activity of TiO2 peaks in the UV, and there have been many efforts to shift this closer to the visible as a result. Building on previous work with composites of graphene and TiO2 he and his colleagues developed a process to produce well separated (to allow reaction space) TiO2 nanotubes wrapped in graphene. Although they did not notice a wavelength shift in the peak catalytic activity to the visible due to the graphene, the catalysis did improve due to the effect on hole and electron transport. Whatever technologies do eventually stick, time is of the essence. Most estimates place the tipping point for catastrophic global warming at 2050. Allowing 30 years for the infrastructure overhaul that could allow alternative energies to totally replace fossil fuels leaves little more than a year for those technologies to pitch “the best return on investment”. 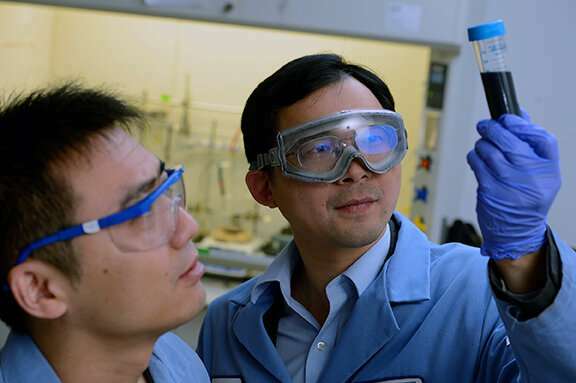 Little wonder advanced energy materials research is teaming. Now, LMU physicists led by Dr. Jacek Stolarczyk and Professor Jochen Feldmann, in collaboration with chemists at the University of Würzburg led by Professor Frank Würthner, have succeeded in demonstrating the complete splitting of water with the help of an all-in-one catalytic system for the first time. Their new study appears in the journal Nature Energy (“All-in-one visible-light-driven water splitting by combining nanoparticulate and molecular co-catalysts on CdS nanorods”). Technical methods for the photocatalytic splitting of water molecules use synthetic components to mimic the complex processes that take place during natural photosynthesis. In such systems, semiconductor nanoparticles that absorb light quanta (photons) can, in principle, serve as the photocatalysts. Absorption of a photon generates a negatively charged particle (an electron) and a positively charged species known as a ‘hole’, and the two must be spatially separated so that a water molecule can be reduced to hydrogen by the electron and oxidized by the hole to form oxygen. “We solved the problem by using nanorods made of the semiconducting material cadmium sulfate, and spatially separated the areas on which the oxidation and reduction reactions occurred on these nanocrystals,” Stolarczyk explains. The researchers decorated the tips of the nanorods with tiny particles of platinum, which act as acceptors for the electrons excited by the light absorption. As the LMU group had previously shown, this configuration provides an efficient photocatalyst for the reduction of water to hydrogen. The oxidation reaction, on the other hand, takes place on the sides of the nanorod. To this end, the LMU researchers attached to the lateral surfaces a ruthenium-based oxidation catalyst developed by Würthner‘s team. The compound was equipped with functional groups that anchored it to the nanorod. “These groups provide for extremely fast transport of holes to the catalyst, which facilitates the efficient generation of oxygen and minimizes damage to the nanorods,” says Dr. Peter Frischmann, one of the initiators of the project in Würzburg. “The development of the new photocatalytic system is a good example of how SolTech brings together the expertise available in diverse disciplines and at different locations. The project could not have succeeded without the interdisciplinary cooperation between chemists and physicists at two institutions,” adds Würthner, who, together with Feldmann, initiated SolTech in 2012. Is Reliable Energy Storage (and Markets) On The Horizon? On Tuesday, May 15, 2018. California became the first state in the U.S. to require solar panels on almost all new homes. Most new units built after Jan. 1, 2020, will be required to include solar systems as part of the standards adopted by the California Energy Commission. While hydroelectric and some other renewable sources can generate power around the clock, solar and wind energy are irregular and not necessarily consistent sources for 24/7 projections. Storms and darkness disrupt solar farms, while dozens of meteorological phenomena can impact wind farms. Because these sources have natural peaks, they cannot be made to align with consumer power demand without effective storage. Solar and wind may be able to meet demand during the day or a short period, but when energy is high and demand is low, the power generated must either be used or wasted if it cannot be stored in some type of battery. According to projections from GTM Research and the Energy Storage Association, the energy storage market is expected to grow 17x from 2017 and 2023. This projection accounts for private and commercial deployment of storage capacity, including impacts from government policies like California’s solar panel mandate. During the same interval, the energy storage market is expected to grow 14x in dollar value. The exact type of storage deployments in these projections varies. Recent innovations have included advancements in traditional battery technology as well as battery alternatives like liquid air storage. In New York, one project included a megawatt scaled lithium-ion battery storage system to replace lead acid schemes. The liquid air storage, however, uses excess energy to cool air in pressurized chambers until it is liquid. Rather than storing electrical or chemical energy like a battery, the process stores potential energy. When demand arises, the liquefied air is allowed to rapidly heat and expand, turning turbines to generate electricity. Meanwhile, Tesla has added nearly a third of the annual global energy storage deployments since 2015. Leading the charge with low-cost lithium-ion batteries, Telsla and other innovators are bringing global capacity up quickly. These energy storage devices are versatile, capable of storing energy from any source–fossil fuel or renewable– and in any place–private homes or industrial operations. With battery costs continuing to decrease and battery alternatives coming into the fore, projections of storage capacity are indeed quite possible. Assuming the electric industry can indeed upgrade its current infrastructure, new grid connections means that energy will be able to be shared more than ever, perhaps even traveling far distances during peak or be stored for non-peak use anywhere on the grid. When storage costs and capacity align with market incentives, we may just see a renewable energy revolution, one that makes distributed generation mainstream for all consumers.